Tassels make a great decorative detail for your finished knit or crochet projects as well as for many other uses around your home. Add them to a shawl like I did for my Cozy Striped Shawl pattern, use them as an extra accent on your curtain tiebacks, or add a fun flair to a blanket. 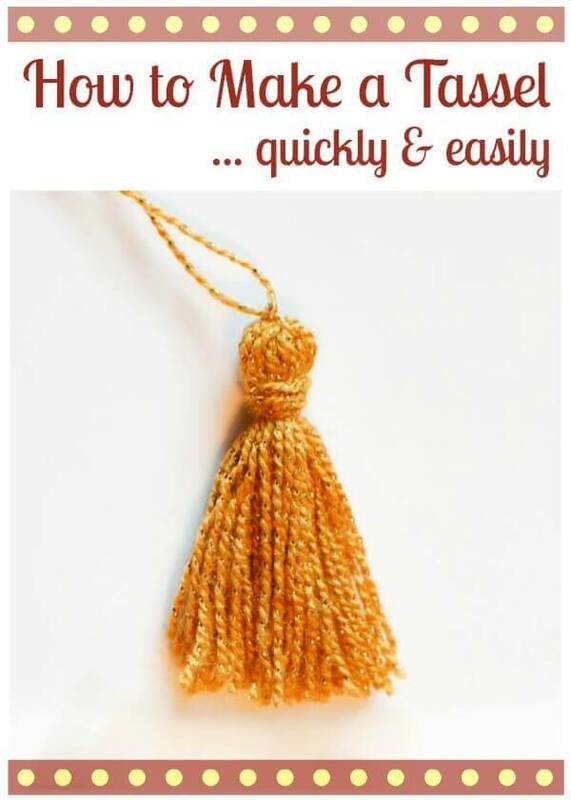 In this tutorial I will show you how to make tassels quickly and easily in any size you desire! And best of all, if consistency is your goal, this method helps keep them all the same size! 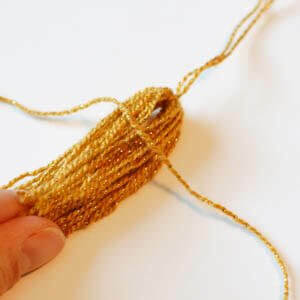 You can make a yarn tassel with leftover yarn from your project or use embroidery thread if you prefer a thinner result. 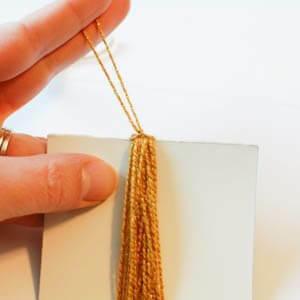 Step 1: Before you begin, determine how long you would like your tassel. For my purposes, I am making mine about 2½ in. long. 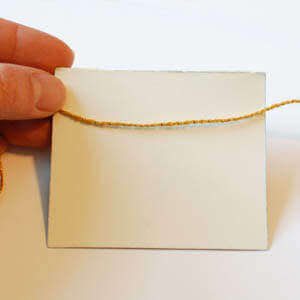 Cut your piece of cardboard or card stock to the height you would like your tassels and wide enough that you are comfortable working with it. Since I want mine to be about 2½ in. long, I cut my cardboard piece to 2½ in. high × 3 in. wide. Step 2: Cut a piece of yarn approximately 14 in. 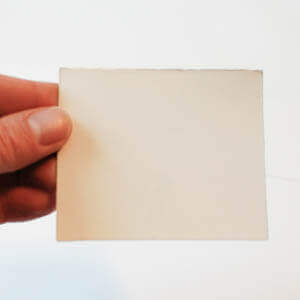 long and place it widthwise across your cardboard piece. 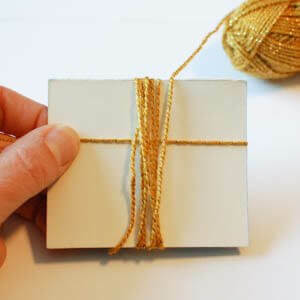 Step 3: Take the rest of your yarn and start wrapping it lengthwise over the yarn you just placed across the cardboard. 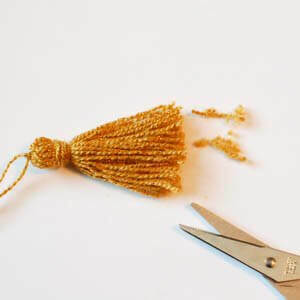 Keep wrapping until you have the density you would like for your tassel. 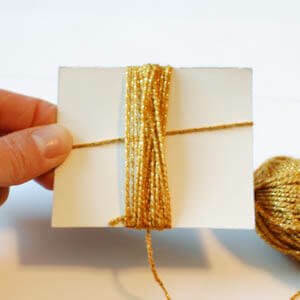 Step 4: Go back and grab the piece of yarn you laid across the width of the cardboard in Step 2 and pull both ends to the top of the cardboard. 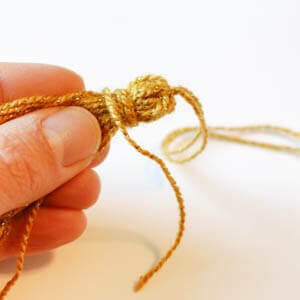 Knot it tightly at the top to secure. Not only does this keep the tassel secure but now you also have a way to hang your tassel when you are done. 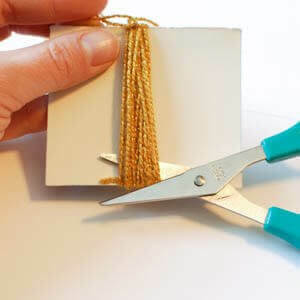 Step 5: Take you scissors and snip through the yarn across the bottom of your cardboard to free your tassel. Step 6: Cut another length of yarn of about 14 in. 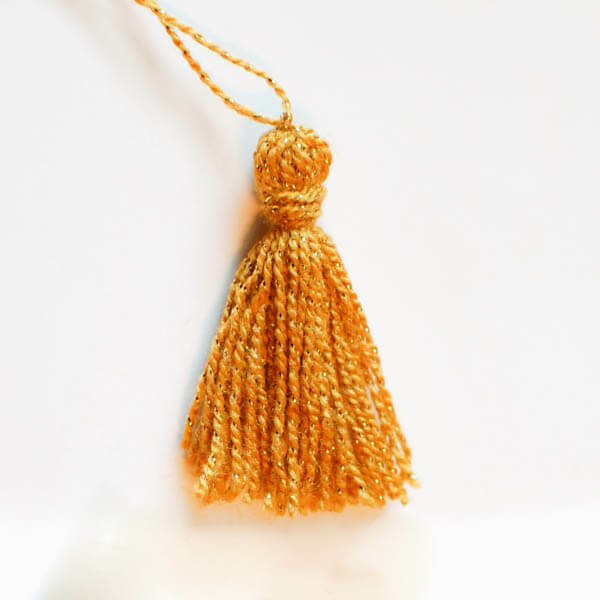 long and wrap it around the head of the tassel about ½ in. or so from the top. Wrap a few more times to secure or until you get the look you want. Tightly knot the yarn and tuck the tails into the center of the tassel to hide them. Step 7: Now just trim the tassel to even up the bottom and you’re done! See how I used these in this Graduation Day Bunting Pattern. Hello, love the tutorial, and I really like the yarn could you please tell me the name of it? Thank you! I have made tassels but they never seemed this easy. Thank for the tutorial. Your tutorial arrived just in time! Now I don’t have to wrap my brain around it.